Bone marrow derived mesenchymal stem cells (bmMSCs) are multipotent cells that can differentiate into diverse cell types, including cardiomyocytes. BmMSC-based transplantation is capable of repairing acute and chronic myocardial infarction. Prior to the transplantation, MSCs are usually induced in vitro by biological reagents and chemicals for directional differentiation. Transforming growth factor beta (TGF-β) is one of the most commonly used biological reagents for induction of cardiomyocyte differentiation of bmMSCs. Previous studies have shown that TGF-β induces senescence in several cell types. However, whether TGF-β affects senescence of bmMSCs has not been elucidated. The goal of this study was to investigate the effect of TGF-β1 on senescence of bmMSCs and the underlying mechanisms. 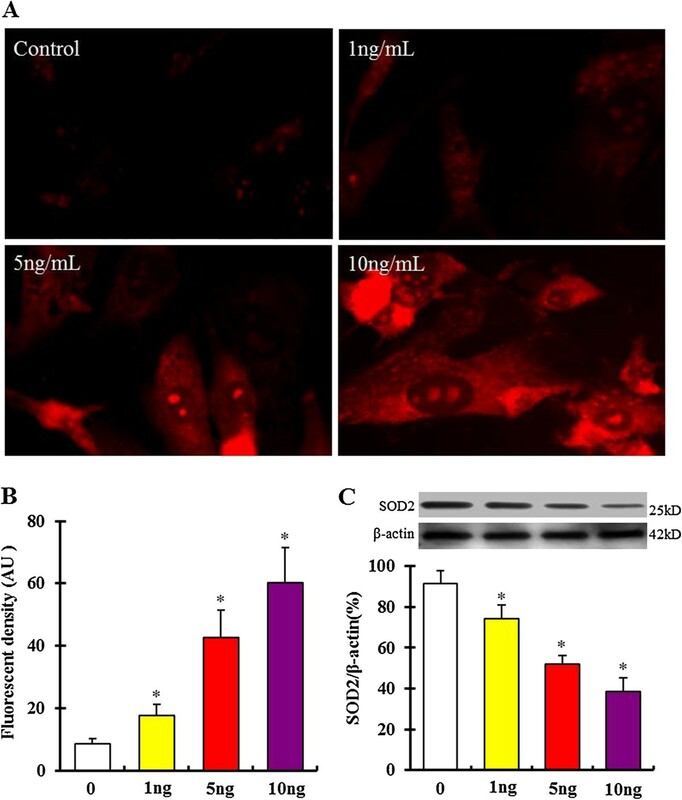 We found that TGF-β1 increased activity of senescence-associated-galactosidase (SA-Gal) and production of mitochondrial reactive oxygen species (mtROS) in bmMSCs in a dose-dependent manner. TGF-β1 also significantly decreased expression of superoxide dismutase 2 (SOD2) and Id1, and increased expression of 4-Hydroxynonenal (4-HNE) subunits and p16 in bmMSCs in a dose-dependent manner. Pre-treatment with mtROS inhibitor acetyl-L-carnitine (ALCAR, 0.1 mM) significantly inhibited TGF-β1-induced mtROS production and SA-Gal activity. TGF-β1 can induce senescence of bmMSCs, which at least partially depends on mtROS production. Mesenchymal stem cells (MSCs) are multipotent adult stem cells with a high capacity for self-renewal and capable of differentiating into a variety of cell types, including adipocytes, osteoblasts, chondrocytes, endothelial cells, cardiomyocytes and neurons [1, 2]. Currently, MSCs have been widely used in regenerative medicine . The most common source of MSCs is bone marrow MSCs (bmMSCs) . Previous studies have shown that bmMSC transplantation has the potential to reduce infarct size and improve cardiac function in animal models of heart failure . BmMSCs are usually induced in vitro with special reagents for directional differentiation before transplantation. Transforming growth factor beta (TGF-β) is one of the most commonly used biological reagents for inducing cardiomyocyte differentiation of MSCs [6–8]. Senescence would result in a permanent cell cycle arrest and make MSCs lose their self-renewal potential . The high proliferative capacity and regenerative potential are main phenotypes of MSCs . Loss of regenerative potential would limit their application in transplantation medicine. TGF-β1 has been demonstrated to induce senescence in tumor cells and other cell lines [11–13]. TGF-β1 has also been shown to increase production of mitochondrial reactive oxygen species (mtROS) in some cell lineages . MtROS production involves aging and cell senescence [14–16]. However, whether TGF-β affects senescence of bmMSCs has still not been elucidated. The purpose of this study was to investigate the effect of TGF-β1 on senescence of bmMSCs and its relation to mtROS generation. Recombinant mouse TGF-β1 and Senescence β-Galactosidase Staining Kit were purchased from Cell Signaling Technology (Danvers, MA, USA). MitoSOX™ Red superoxide indicator, L-glutamine, ProlongH Gold antifade reagent with DAPI and DMEM were purchased from Invitrogen Life Technologies (Carlsbad, CA, USA). Acetyl-L-carnitine, β-glycerophosphate and Oil Red O were purchased from Sigma-Aldrich (St. Louis, MO, USA). DAB Substrate Kit, PE-conjugated CD44 antibody, FITC-conjugated CD90 antibody, 4-HNE, SOD2, β-actin primary antibodies and HRP-conjugated secondary antibodies were purchased from Abcam (Cambridge, MA, USA). Alkaline phosphatase antibody was purchased from Santa Cruz Biotechnology (Santa Cruz, CA, USA). HyClone Fetal Bovine Serum (FBS) was purchased from Thermo Fisher Scientific Inc. (Cleveland, OH, USA). ECL Western-blotting substrate was purchased from Thermo Fisher Scientific (Rockford, IL, USA). The PVDF membrane was purchased from GE healthcare (Pittssburgh, PA, USA). BmMSCs were isolated and cultured as recently published protocols [17, 18]. In brief, bone marrow was harvested from tibia and femoral of C57BL/6 mice and cultured in DMEM supplemented with 15% FBS, 2 mM L-glutamine, 100 μg penicillin, and 100 μg streptomycin. After 3 hours incubation, the non-adherent cells were removed and the medium was replaced. A purified population of bmMSCs can be obtained following 3 weeks of culture. The 3rd passage bmMSCs were used in the experiments. The animal use and study protocols were approved by the Ethics Committee of Xinxiang Medical University. BmMSCs were plated in 6-well or 12-well plates and treated with 1, 5 and 10 ng/mL recombinant mouse TGF-β1 for 24 hours. The cells cultured in the common medium served as control. In the subsequent experiments, cells were pretreated with 0.1 mM acetyl-L-carnitine (ALCAR) for 30 min, and then exposed to 5 ng/mL TGF-β1 for 24 hours. The osteogenic differentiation culture was performed as previously reported protocols . In brief, bmMSCs were plated in 24-well plates with round coverslips and cultured with DMEM supplemented with 2% FBS, 5 mM β-glycerophosphate and 50 μM L-ascorbic acid-2-phosphate for 3 weeks. The medium was changed every three days. 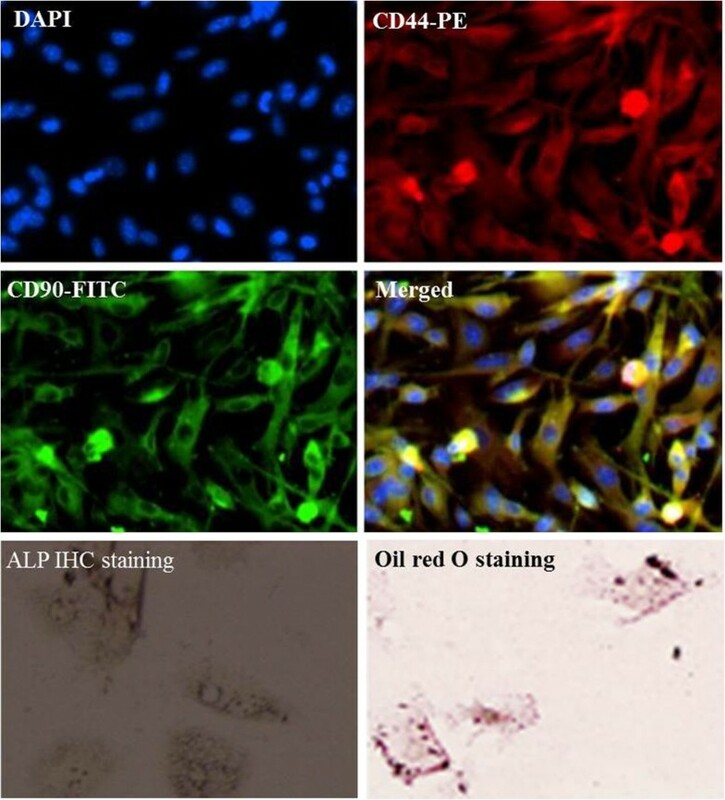 The osteogenic differentiation was analyzed by immunochemistry staining to measure expression of alkaline phosphatase (ALP) which is a maker of osteoblasts. The immunochemistry staining was performed as standard protocols. BmMSCs were plated in 24-well plates with round coverslips and cultured in the induction medium (DMEM supplemented with 10% FBS, 1 μM dexamethasone, 60 μM indomethacin, 10 μg/mL insulin, and 0.5 mM 3-isobutyl-1-methylxanthine) for 3 days. Subsequently, the cells were cultured in the maintenance medium (DMEM supplemented with 10 μg/mL insulin) for 3 weeks. The maintenance medium was changed every other day. The adipogenic differentiation was analyzed by Oil Red O staining. BmMSCs were plated in 24-well plates with 10 mm round coverslips. After 24-hour culture, the cells were fixed with 4% buffered formaldehyde for 15 min and treated with 0.1% Triton X-100 for 10 min at room temperature. And then, the cells were incubated with 1% BSA/10% goat serum for 30 min, and subsequently incubated with PE-conjugated goat anti-mouse CD44 antibody for 1 hour at room temperature in the dark. After washing thrice with PBS, the cells were incubated with FITC-conjugated goat anti-mouse CD90 antibody for 1 hour at room temperature in the dark. After washing with PBS and deionized water, the cells were mounted on slides using ProlongH Gold antifade reagent with 4’,6-diamidino-2-phenylindole (DAPI), and imaged with a fluorescence microscope. In this study, cell senescence was analyzed using a Senescence-β-Galactosidase Staining kit. BmMSCs were plated in 12-well plates. Following 24 hours of culture, the cells were treated with TGF-β1 for additional 24 hours. After treatments with TGF-β1, the cells were washed twice with PBS and fixed with 0.5 mL 1Х fixative solution for 15 min at room temperature. After rinsing twice with PBS, the cells were incubated with 1 mL β-Galactosdase staining solution in a dry incubator without CO2 at 37°C overnight. The cells were imaged with a microscope when β-Galactosdase staining solution is still on the plates. The blue-dye-positive cells were viewed as senescent cells. In this study, mtROS were measured using a MitoSOX™ Red mitochondrial superoxide indicator, as the manufacturer’s instructions. Briefly, bmMSCs were cultured in 24-well plates. After treatments with TGF-β1, the cells were incubated with 5 μM MitoSOX™ reagent working solution for 10 min at 37°C in the dark. After washing thrice with warm PBS, the fluorescence was imaged with a fluorescent microscope. Proteins were extracted from the treated bmMSCs and separated by 12% SDS-Polyacrylamide gel electrophoresis (SDS-PAGE). Following electrophoresis, proteins were transferred to PVDF membranes. The membranes were blocked with 5% BSA in Tris-buffered saline with Tween-20 (TBS-T), and then incubated with rabbit anti-mouse 4-HNE, P16, Id1 and β-actin primary antibodies at 4°C overnight. Then, the blots were washed thrice with TBS-T, and subsequently incubated with HRP-conjugated secondary antibody for 1 hour at room temperature. The immunoreactive bands were visualized with enhanced chemiluminescence. Statistical analysis was performed with SPSS11.5 software. Data were presented as mean ± SD from 4 independent experiments. Univariate comparisons of means were evaluated using the Student t test and/or one-way ANOVA with Tukey’s post-hoc adjustment for multiple comparisons when appropriate. P < 0.05 was considered a statistically significant difference. Immunofluorescence staining showed that bmMSCs were positive for CD44 and CD90, which are MSC specific markers [1, 20]. It is known that bmMSCs have the potential to differentiate to osteoblasts and apidocytes. High alkaline phosphatase (ALP) activity is an indication of successful differentiation of MSCs to osteoblasts . Immunochemistry staining showed that most of bmMSCs positively expressed ALP after exposure to osteogenic differentiation medium for 3 weeks (Figure 1). Intracellular lipid vesicles are typically observed in adipocytes, which can be stained with Oil Red O. Our data showed that lipid droplets were accumulated in a part of bmMSCs after exposure to adipogenic differentiation medium for 3 weeks (Figure 1). Identification of bone marrow mesenchymal stem cells (bmMSCs). Immunofluorescence assay shows that bmMSCs positively express MSC markers CD44 and CD90. Immunochemistry staining shows that alkaline phosphatase (ALP) is positively expressed in bmMSCs following 3 weeks of osteogenic differntiation culture. Oil Red O staining displays that lipid droplets are accumulated in a part of bmMSCs following 3 weeks of adipogenic differentiation culture. β-Galactosidase activity at PH 6 is present only in senescent cells and viewed as a special marker for cellular senescence [21, 22]. In this study, the senescence of bmMSCs was analyzed using a Senescence-β-Galactosidase Staining kit. As shown in Figure 2, senescence-associated-galactosidase (SA-Gal) activity was significantly increased in bmMSCs in a dose-dependent manner after exposure to 1, 5 and 10 ng/mL TGF-β1 for 24 hours. SA-Gal activity was also increased in bmMSCs in a time-dependent manner as the cells were exposed to 5 ng/mL TGF-β1 (Figure 3). 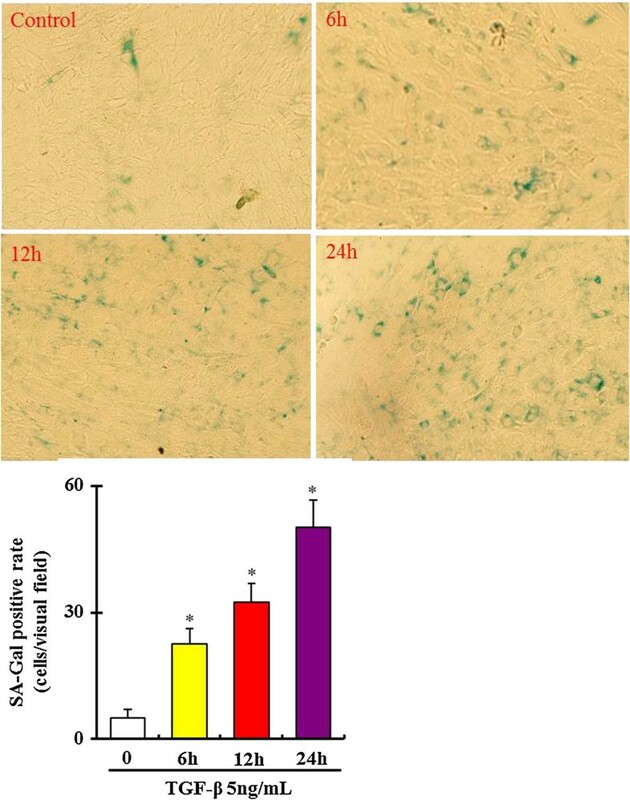 Dose–response of β-galactosidase activity in bone marrow mesenchymal stem cells (bmMSCs) after exposure to 0, 1, 5 and 10 ng/ mL recombinant mouse transforming growth factor β1 ( TGF-β1) for 24 hours. Bar graphs represent mean ± SD (4 independent experiments/group). *P < 0.05 vs. control. Time-response of β-galactosidase activity in bone marrow mesenchymal stem cells (bmMSCs) after exposure to 5 ng/ mL recombinant mouse transforming growth factor β1 (TGF- β1) for 0–24 hours. Bar graphs represent mean ± SD (4 independent experiments/group). *P < 0.05 vs. control. 4-Hydroxynonenal (4-HNE) is a highly reactive aldehyde generated by the exposure of polyunsaturated fatty acids to peroxides and ROS. 4-HNE plays a key role in signal transduction and numerous cell cycle events. The expression of 4-HNE subunits has also been involved in the senescence-associated ROS production and viewed as a marker of aging [23–25]. Our result showed that expression of 4-HNE subunits was markedly increased in bmMSCs as the cells were exposed to 1, 5 and 10 ng/mL TGF-β1 for 24 hours (Figure 4A). P16 and Id1 are also important markers of aging [13, 26]. Our western blot data showed that p16 expression was markedly increased, but Id1 expression was decreased in bmMSCs as the cells were exposed to 1, 5 and 10 ng/mL TGF-β1 for 24 hours (Figure 4B and C). Western- blot assay shows expression of aging marker proteins 4- Hydroxynonenal ( 4-HNE), p16 and Id1 in bmMSCs after exposure to 0, 1, 5 and 10 ng/ mL TGF- β1 for 24 hours. A. 4-HNE expression; B. P16 expression; C. Id1 expression. Bar graphs represent mean ± SD (4 independent experiments/group). *P < 0.05 vs. control. It is known that mtROS involve cellular aging [15, 27]. In this study, mtROS were measured using a MitoSOX Red indicator kit. As shown in Figure 5A and B, mtROS were markedly increased in bmMSCs after exposure to 1, 5 and 10 ng/mL TGF-β1 for 24 hours. Superoxide dismutase 2 (SOD2) is a mitochondrial matrix enzyme that protects mitochondria against oxidative radicals . Previous studies have shown that deletion and downregulation of SOD2 both cause cellular senescence through increasing mtROS production [16, 28]. Our results showed that SOD2 expression was significantly decreased in bmMSCs after exposure to 1, 5 and 10 ng/mL TGF-β1 for 24 hours (Figure 5C). Mitochondrial reactive oxygen species ( mtROS) production in bone marrow mesenchymal stem cells (bmMSCs) after exposure to 0, 1, 5 and 10 ng/ mL TGF -β1 for 24 hours. A. MitoSOX™ Red Indicator staining shows mtROS in bmMSCs after exposure to 0, 1, 5 and 10 ng/mL TGF-β1 for 24 hours. B. Quantification of fluorescence density of mtROS. C. Western blot assay shows expression of superoxide dismutase 2 (SOD2) in bmMSCs after exposure to 0, 1, 5 and 10 ng/mL TGF-β1 for 24 hours. Bar graphs represent mean ± SD (4 independent experiments/group). *P < 0.05 vs. control. Acetyl-L-carnitine (ALCAR) is a specific inhibitor of mtROS [29, 30]. Our results showed that ALCAR (0.1 mM) significantly inhibited TGF-β1-induced mtROS generation and SA-Gal activity in bmMSCs (Figure 6). 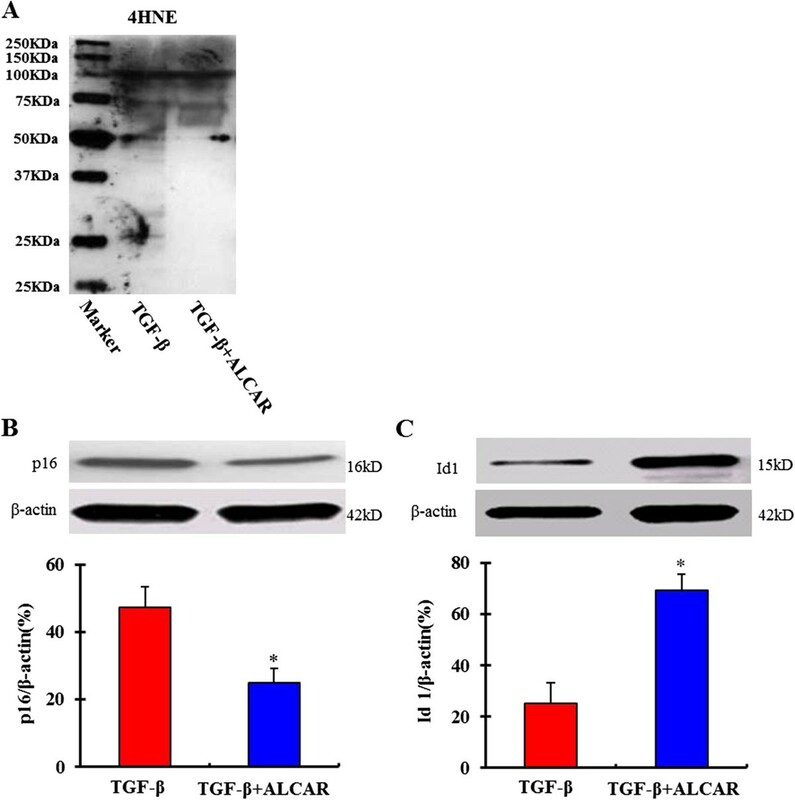 In addition, ALCAR also markedly inhibited TGF-β1-induced 4-HNE subunits expression, and promoted Id1 expression (Figure 7). Mitochodrial ROS (mtROS) specific inhibitor acetyl- L- carnitine ( ALCAR) inhibits TGF- β1- induced mtROS generation and bmMSC senescence. Bar graphs represent mean ± SD (4 independent experiments/group). *P < 0.05 vs. treatments with 5 ng/mL TGF-β1. 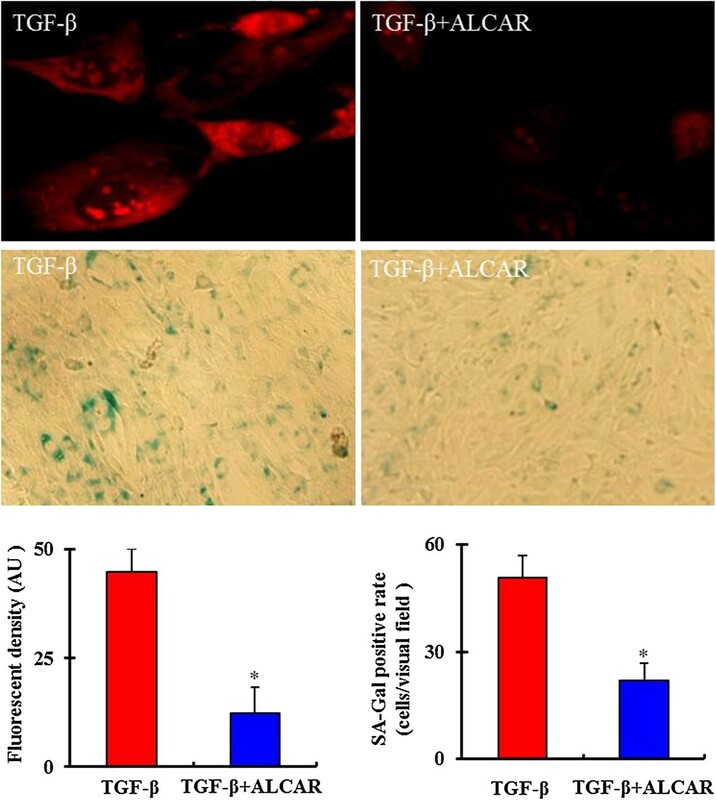 Expression of aging markers 4- Hydroxynonenal ( 4- HNE), p16 and Id1 in bmMSCs as the cells were exposed to acetyl- L- carnitine ( ALCAR, 0.1 mM) and TGF- β1 (5 ng/ mL) simultaneously. A. 4-HNE expression; B. P16 expression; C. Id1 expression. Bar graphs represent mean ± SD (4 independent experiments/group). *P < 0.05 vs. treatments with 5 ng/mL TGF-β1. In the present study, we investigated the effect of TGF-β1 on senescence of bmMSCs. Our results showed that treatments with TGF-β1 (1 ~ 10 ng/mL) increased SA-Gal activity and mtROS production in bmMSCs in a dose dependent manner. 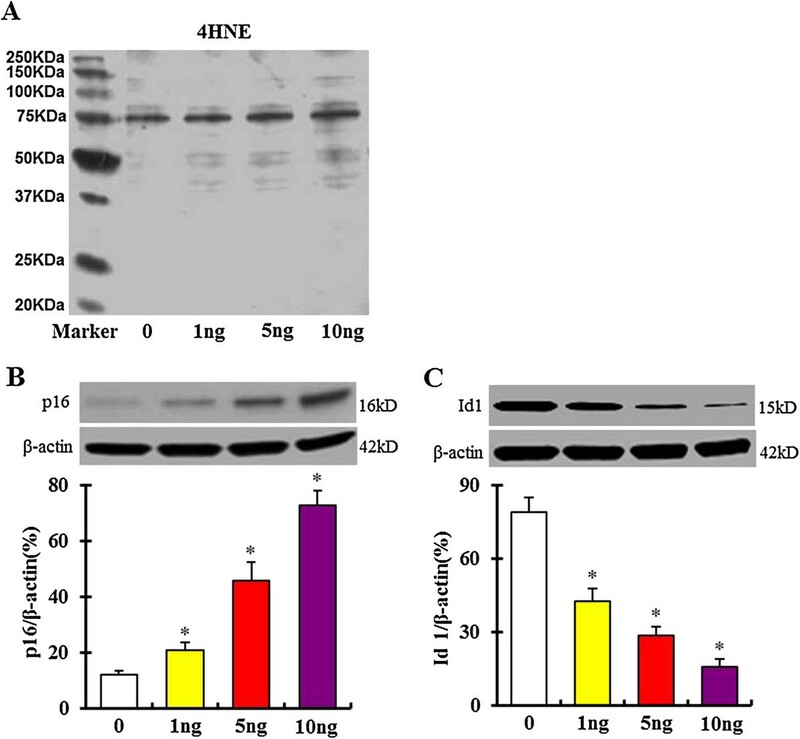 The aging promoter p16 and oxidative stress inducer 4-HNE were markedly increased; however, their opponents Id1 and SOD2 were significantly decreased in bmMSCs after exposure to TGF-β1. 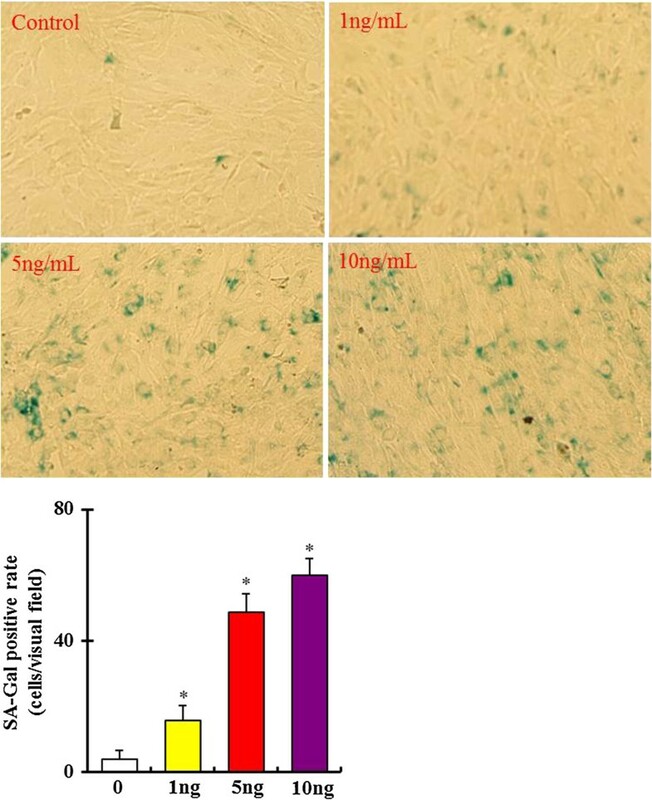 Application of mtROS inhibitor acetyl-L-carnitine significantly inhibited TGF-β1-induced mtROS production and bmMSC senescence. These findings demonstrate that TGF-β1 can cause senescence of bmMSCs, which involves mtROS production. BmMSCs are the most promising sources of stem cells and have been widely applied to treat cardiac diseases . Transplantation of bmMSCs has the potential to reduce infarct size and improve ventricular compliance after myocardial infarction . BmMSCs are usually pre-treated with some biological reagents and chemicals, such as 5-azacytidine, TGF-β, angiotensin II, hypoxia-inducible factor-1 alpha (HIF-1α) and slingshot-1 L (SSH1L) for cardiomyocyte differentiation, prior to transplantation [6, 7, 31–33]. Among these reagents, TGF-β is the most commonly used one. Previous studies have shown that TGF-β1 and -β2 have the potential to induce senescence of tumor cells and other kinds of normal tissue cells [11–13]. Our results showed that treatments with TGF-β1 markedly increased SA-Gal activity in bmMSCs, which showed that these cells were undergoing senescence. Senescence would lead to phenotype changes and low proliferation of bmMSCs, which reduces the efficiency of bmMSC-based transplantation . Our results showed that TGF-β1 induced expression of 4-HNE subunits. 4-HNE, a major lipid peroxidation (LPO) product, plays key roles in signal transduction pathways, and participates in cell cycle events. While lower levels of intracellular 4-HNE are beneficial to cells, possibly promoting cellular proliferation; however, higher levels cause toxic responses in cells, including cell senescence and apoptosis. Expression of 4-HNE has been proved to induce cell senescence and organ aging [23, 35, 36]. We found that p16, an important regulator of aging, was markedly upregulated in the TGF-β1-treated bmMSCs; however, Id1, a negative regulator of p16, was markedly downregulated in these cells. These data were consistent with previous reports from other groups, which showed that p16 protein was highly expressed, but Id1 protein was downregulated in the senescent cells and aged tissues [13, 26, 35]. More interestingly, mtROS production was also markedly increased in bmMSCs after exposure to TGF-β1. This data is also consistent with expression of 4-HNE that has been widely accepted as an inducer of cellular oxidative stress [23, 25]. Previous studies have shown that TGF-β1 can increase mtROS production in tumor cells . MtROS has also been known as key inducer of aging . We also observed that SOD2 was significantly downregulated in bmMSCs after exposure to TGF-β1. SOD2 is known to be a key enzyme that protects mitochondria from ROS insult [16, 38]. To further elucidate the role of mtROS in TGF-β1-induced bmMSC senescence, we treated bmMSCs with mtROS specific inhibitor acetyl-L-carnitine (ALCAR) when the cells were exposed to 5 ng/mL TGF-β1. Our results showed that ALCAR (0.1 mM) significantly inhibited TGF-β1-induced mtROS production and increase of SA-Gal activity. These data show that TGF-β1-induced senescence of bmMSCs at least partially depends on mtROS production. This study shows that TGF-β1, one of the most commonly used reagents for inducing cardiac differentiation of MSCs, causes senescence of bmMSCs. The action of TGF-β1 on bmMSC senescence depends on mtROS production, because blockade of mtROS production markedly inhibits TGF-β1-induced senescence of bmMSCs. WJ and NJ carried out cell culture and immunofluorescence, cellular chemistry, β-Galactosidase staining. WJ, LX and WX carried out ROS staining and Western-blotting assays. ZF designed the study, analyzed the data and wrote the manuscript. GZ helped ZF to design the study and participated in manuscript writing. All authors had read and approved the final manuscript. Junfang Wu, Jie Niu contributed equally to this work. This study was supported by a grant from the National Natural Science Foundation of China (81370428).